Mahindra Group is pioneering electric car sales in India, with their acquisition of maini group’s tiny electric car Reva, re-branded as e2o. But e2o sales have been very poor due to high cost, limited range and non availability of charging infrastructure. I had reviewed the first generatione20 here in an earlier post. Recently an upgraded e2o with 4 doors has been launched, called e2o Plus. Said to be a better version with longer range, more space, new e2o is trying to win customers. Self drive company Zoomcar had this car in its fleet in Mysuru- just when I was thinking of booking it for a day, I noticed that Zoomcar has discontinued Mahindra e2o from its fleet. The reasons are not known- may be no demand and high maintenance. 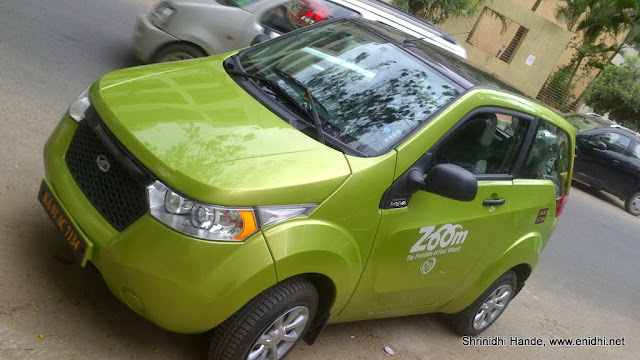 Given Mahindra is a major investor in Zoomcar, I thought they will push for more Mahindra cars in Zoomcar’s fleet. Anyway, one of the major reason why customers hesitate to buy electric car in India is its range. About 100-150 kms of range is just not enough- you can’t do a Bengaluru-Mysuru trip or Mumbai Pune trip or even a trip from one end of city to another and back. This is because we hardly have any charging infrastructure. But it is a catch 22 situation for electric car manufacturers and customers- customers expect good charging infrastructure before they can buy the car, manufacturers want some sales to happen so that they can get some returns on their investment and can think of investing more. I feel it is in Mahinra's interest to blink first and invest in infrastructure, as they stand to gain significantly through increased sales. I have a simple idea for Mahindra group and its chairman Anand Mahindra. If they can take this idea and execute, I believe sales of e2o will increase substantially. Problem: There’re no public charging stations for electric cars- because of this owners of electric cars have limited range and should return home to charge. Solution: Provide few reserved parking space for electric cars in various retail properties owned by Mahindra group and make these places accessible to electric car (such as e2o) owners. In each of these facilities, a few parking spots can be reserved exclusively for owners of electric car vehicles, such as e2o and be made accessible to them through an app. An electric car owner can use the app to check available charging stations closer to wherever he/she wants to go (for work/leisure etc), park the car at these dedicated parking lots and put them for charging, come back from work/leisure activity and continue the journey with a more charged car and enjoy a longer range. This will make owning electric car lot more practical and more and more people will come forward to own electric cars. When these Mahindra group companies providing charging infrastructure, they might win some new customers as well. For example an electric car owner who goes to a Club Mahindra resort to charge his car might chose to have lunch there with his family, or when he/she goes to Mahindra showroom to charge their car they may look at latest cars in the showroom and may be buy one next or tell about it to their friends. So the kind act of providing charging facility can payback in additional publicity and revenue. Some advertising and marketing, to encourage existing electric car owners to use them and to encourage more people to buy electric car, now that charging facility is available throughout the city. If Mahindra group leads by example, then it will motivate other players and government to provide charging infrastructure in their campus, this offering even more charging options to electric car owners. Having strong charging infrastructure also aids sale of other e vehicle, like e-verito. Also Mahindra can tie up with other electric car makers- Toyota who sells Camry and Prius hybrid. Of course cost is a concern- electricity from commercial establishments cost lot more than domestic ones- but I guess this can be worked out- Mahindra group can work with government to give some exemption or reduced tariffs for electricity used for charging cars. If nothing works out, car owners may be asked to pay a fee to the tune of electricity bill. May be some solar panels can be used to reduce charging post. What do you think of this idea? Would you consider buying an electric car if there’re several charging stations all over the city? Do you think Mahindra group should pick it up and execute? I have been a senior research fellow in ASCI, hyd in this field in 2004 and have published a white paper on the the lessons learnt from the west to promote electric vehicles in India. I had even given a business plan to the government and Reva which involved battery replacement but nothing worked out. First Cry store is also belong to them, if all mahindra group companies start giving space for parking and charging then they loose their space of parking and they do not get anything ,company will always keen on their core business from each unit. If they park for charge also how many hours to take for half or full charge till such time what customers will do in that premises or do they have alternate plan? not asking for all parking space- just one or two, that too only to be assigned on priority to electric cars (normal cars can use it otherwise)... Yes, some formalities like cost aspect need to be worked out, but if there's a will these can be sorted out.